As I've mentioned in the ole blog before, I've done every diet in the book. I started and stopped. I've lost and gained. I've been excited at my progress, and I've been frustrated about a lack of progress. This is me with my best friend from high school. Age, 15. When I was 15 or 16 years old, I joined WW for the first time. My mom had previously lost a lot of weight on WW, and when I began rapidly gaining weight as a teenager, we thought it would be a good opportunity for me to lose some of that weight, and learn about portion control. I don't think that the online program was really an option yet, since this was 2004-2005. My doctor had to sign something for me to go, and honestly, I think he thought I was just eating fast food and not telling my parents. Truthfully, I was not (I couldn't even drive yet and I didn't have any money), and I was working out with a personal trainer a few days a week. WW was a good learning experience, but for me, it wasn't something I really wanted yet. I wanted to lose weight to fit back into the clothes I'd grown out of, but at the same time I didn't want to pull out a paper tracker in front of my friends at lunch, or look up points when I did go out to eat with friends on the weekend. In my opinion, WW's eTools have completely revolutionized tracking for the younger generations. Now, you can track your food or look up PointPlus on your phone and it just looks like you're checking Facebook or texting, but more on that later. I don't think anyone should really gauge Metabolic by my experience. I don't remember exactly how old I was when I did this, but I think it was the summer before I started college, so 2007. I only did it for a summer, and I think I lost about 5-10 pounds. I wasn't able to keep it off though because one of the big things with this weight loss program is their protein drinks, which I couldn't keep up when I moved 5 hours away for college. It was also VERY expensive. Thankfully, my parents paid for it since I was only 18 years old, but if I wanted to go back to it now, I wouldn't be able to afford it. Another thing about this program is that the staff seemed to really target more of a middle-aged demographic. As a teenager, I went in to weight in the first time. I had lost a couple of pounds, and they made me hold a model of what a pound of fat feels like and looks like. Although educational, I only wanted to lose a little bit of weight, and it made me feel like I was being treated like an obese child. Overall, I think that Metabolic is probably a good program for those who can afford it and need to take drastic measures to lose a lot of weight. My freshman year of college, I got the Southbeach Diet book (SB) and read it cover to cover. I'd been diagnosed with insulin resistance, and SB seemed to be low in carbohydrates and sugars, which is what I needed. Also, my best friend Chastity had just lost some weight using SB, and I basically do everything she does, so I thought it'd be a good option for me. It taught me a lot about good carbs vs. bad carbs and good fats vs. bad fats. It is pretty sustainable as a lifestyle change if you're not eating prepared food from a college cafeteria for every meal. I'm pretty sure it was a fad that was a better option that Adkins, but has kind of gotten lost in the shuffle of fad diets. I don't think I really lost any weight on it, but it did help me eat healthier my freshman year of college and I don't really think I gained much weight that year (yay for avoiding freshman 15)! End of my freshman year at Samford. I look amused, right? Oh, and hey hot pink nails! The summer before my sophomore year of college, I became a runner. I was going to be taking "Concepts" (if you went to Samford, you're all too familiar with this course that is required for everyone to take to graduate) and I was determined not to be the slow, fat girl at the end of the 5K. Thankfully, my dad is AWESOME, and he agreed to get up with me about 4 mornings a week at the crack of dawn (we're talking 95 degrees before 6 a.m. in Florida) to run with me. My family also traveled a lot that summer for my dad's job, so my dad and I made a pact that we'd take our running clothes and shoes with us every place we went. Honestly, I value that summer so much. My dad and I have great memories of the talks we'd have when we'd stop to walk, and we got to see some pretty cool places on foot. When I got back to Samford for the fall semester of my sophomore year, I'd lost a good bit of weight. I was more toned than I'd ever been before. On Tuesdays and Thursdays I had Concepts class as 8 a.m., so I had a built-in workout every week. On Mondays, Wednesdays, and Fridays, I didn't have class until 11:45, so I always had time to run. I also lived right across from the brand new gym at Samford, so I really just had it made that semester. Carnation Ball Fall 2008 with my Big (left) and Little (right). As I began really losing weight for the first time in my life, I also began eating less. I'd bought myself my first iPhone that fall, and I found an app that allowed me to track my calories (kind of like myfitnesspal, but we're talking 2008, so I don't think that one was around yet). I was WAY under eating. I was running 3 miles a day, 4 days a week and eating 900 calories - and not even 900 calories of nutrition. One of my favorite lunches that semester was a scoop or two of peanut butter with some M&Ms mixed in. Also, vanilla soft-service from the caf with peanut butter and Cinnamon Toast Crunch. Yum! I'd eat that, and maybe a piece of chicken, and that's all. For the whole day. Obviously, this was not healthy or sustainable. The next semester I had a much busier schedule and I began to slowly gain the weight I'd lost back, and I slowly but surely lost my running momentum. One thing that I did gain from this though was learning to really own my health and fitness. Even though my eating choices weren't good, I learned how to build exercise into my life on my own. I learned how to take control of my eating and exercise. That is a lesson that has served me well even 6 years later. Christmas 2008 with my Phi Mu Family. I'm pretty sure this was supposed to be Tack Christmas, but Grace and I were having no part in that. The shortest diet I've ever done was the Dukan Diet. It started when I heard that my friend and her mom were having a lot of success with it. It ended when I started sauteing some veggies in front of her and she told me I couldn't have veggies on the diet. The "no veggies" thing is only part of the "Attack" phase, but even that "short" phase was too long for me to go without veggies. I know people who rave about Dr. Dukan's diet, but I'm just not one of them. College gradation with my family. After I graduated from college, I took advantage of a weight loss program that was monitored by a physician from the OB/GYN practice my doctor is a part of. This has been my most successful weight loss program to-date. Before I did anything, I went to have a complete scan/physical. They tested my heart, they tested my blood, they did all sorts of scans and gave me printouts of the parts of my body that had the most muscle and all sorts of things. They do prescribe Phentermine, which is an appetite suppressant. I only took half a pill a day, but it's not something you can do long term. It's REALLY expensive. My parents helped me pay for it upfront, but after a few months I paid for it on my own and it was a pretty challenging payment to make as a recent college graduate. It worked. But I couldn't eat fruit or any sugar at all. I'm fine with the whole no sugar thing, but I'd like to be able to eat fruit. The no fruit thing made me a little uncomfortable. You're supposed to be able to add it back in, but when I did, I started gaining weight back. I lost about 16 lbs. in a 12 week session. Not bad. I would love to go back on this plan, but I can't afford it. I learned A LOT about nutrition and about my eating habits on this plan. I learned to shop the perimeter of the grocery store and to stay away from the isles with all the processed food. I learned to adapt to my eating plan in a restaurant. I learned that my body responds well to a no-sugar diet. I also learned that's not 100% sustainable (again, I missed fruit). Jason proposed on February 4, 2012. Our wedding date was set for September 22nd of that year. I had gained back the weight I'd lost the previous summer on the SP diet, and I was not a happy camper. It took me a while to go wedding dress shopping because I only had 3 bridesmaids and they all lived in Florida. Finally, in April, we set a date to go dress shopping. I was terrified to try on wedding dresses. Even when I was in the best shape I've ever been in, I'm still very very curvy. I also have a darker complexion, so I tend to stick with browns, blacks, and bold, gemstone colors (that's what Stacey London says to do on What Not to Wear). Also, black is slimming. I was so afraid that I was going to look like a chubby cloud that got caught up in a pallet of white tool in a wedding dress. So what do I do when I'm terrified of something that I can't control? Well, I try to control it of course! It was brutal, but I did lose some weight on it. The worst part about it was eating tomatoes (you can read about that awful experience here). It's not meant to be sustainable. It's 7 days. 1 week. Anyone can do just about anything for a week and survive. It really did reset my body. I haven't been able to eat fried food the same way since then. I felt great about myself when I went dress shopping. It really is what started my blogging life. It also allowed me to be vulnerable on my blog, which I'd never done before. It opened up a world of encouragement from people who were readers and I had no idea! I don't know that I'd ever do a cleanse again (I tried a year later and it was a total fail). The stars really just aligned for me to do it the first time. Jason was traveling, so I was only cooking for myself. I had a great motivation in the fact that I had something to look forward to at the end. I didn't know what to expect, so that helped keep me going because I just kept thinking that it would get better and be worth it. 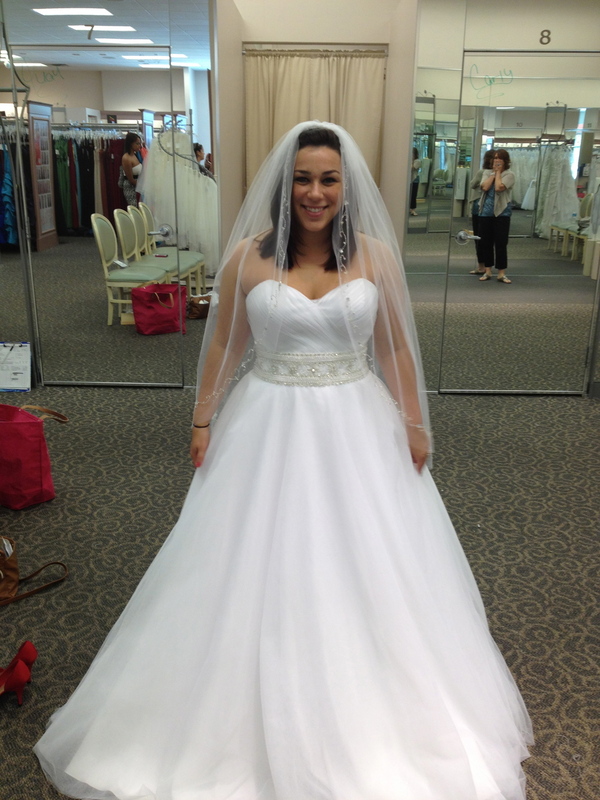 This is me at David's Bridal. I chose the 6th dress that I tried on. I love my mom's face in the mirror :) Worth every tomato. Three months before my wedding, I subscribed to WW online. I didn't really want to lose weight as much as I wanted to just maintain the weight that I was at and not gain any. Mission accomplished. No loss. No gain. Our engagement photos the summer before we were married. The 24 Day Challenge was kind of a turning point for me. 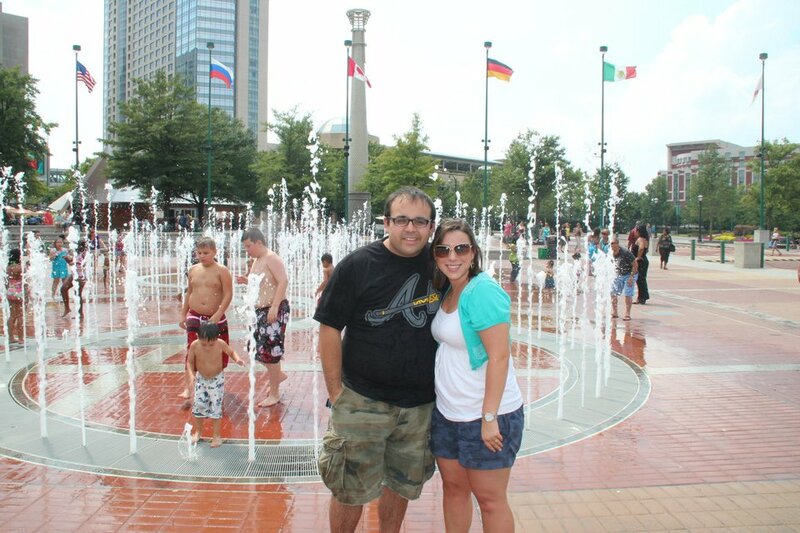 After being married for almost a year, I had gained about 20 lbs. since we said "I do". I was tired of going up, up, up, and I decided to give myself a year to lose the weight I'd gained. After a lot of consideration and coming up with a game plan to pay for the challenge smoothies, cleanses, and supplements, I decided to do that 24DC beginning on June 1, 2013. I had a good friend who had done it, and she was so encouraging through the process. At the end of it all, I lost about 8 lbs. I was happy with those results, but I wanted to keep going. A lot of people "my age" (I'd say within 10 years of my age) are doing it, so it's easy to find someone to encourage you all the way through. While there are supplements and shakes that you have to buy, you can also eat real food. The 24DC is basically a jump start on clean eating. I enjoyed learning about what kind of food that includes. I've tried to stick to a "clean eating" type diet since then, at least most of the time. If you can afford to stick with the program on the back end, it really does work. Around Halloween this year, I realized that I'd gained back what I'd lost with the 24DC, and I'd gained about 10 lbs. on top of that. I wasn't moving enough and I was eating too much. Even so, I still ate fairly healthy. I cried to Jason on probably a weekly basis about my weight. There have been so many opportunities over the last year or so for me to go to a pool, beach, or do something outdoors that people my age (24) should be able to do, and I avoid them like the plague because I'm embarrassed of my weight. The last thing I want to do is get in a bathing suit of any kind. I asked Jason if I could join WW again. We talked about it and prayed about it, and we decided that it would be good for me to join. I opted to do the WW meetings because I need the accountability. I'm a person who really cares what my doctor or weight loss instructor thinks about my weight. I have canceled doctors appointments before just because I'd gained weight, and ultimately, when I gained a little bit of weight in the maintenance phase of the SP diet, I quite going. So I needed someone to look at my weight, write it down, and tell me, "You're up a little bit" or celebrate with me if I've lost. WW was affordable, and I've seen it work with my mom before - and Jennifer Hudson. Obviously. So I began WW for the 3rd time in November. The first week I lost 2 lbs. Yay! I was on my way! But then, in the weeks after, I gained 0.2 here or 0.5 there. By Christmas, I was back where I'd started. I was trying SO HARD and I was SO FRUSTRATED. I talked to my mom and dad about it while we were home for the holidays, and they suggested I up my exercise. So I came home with a plan that was doable, and Jason and I were going to do it together. The first week of January, I had a few BIG changes. I went to the doctor for a check-up. I decided to talk to her about my weight and just be really honest with her. She did some blood work, and as it turns out, I have an under active thyroid (hyopthyroidism). She immediately put me on medication. A few days before that, I decided to give a go at WW's Simple Start program. Results: The first week's weigh in that I was on Simple Start, I lost. I had also started the medicine for my thyroid halfway into that week. The second week I was on Simple Start, I lost again. Plus, I think the medicine was really in my system by then. Needless to say, I'm keeping with the Simply Filling plan with WW, because it seems to be working. Both weeks, my loss has not been a significant amount, but just the loss in and of itself for me is a huge milestone. I'm not sure if it's the Simple Start that did it, or the medicine, or the combination of both, but I'm happy to be on a losing streak. I wanted to write this post to give you some ideas on some of the diets and weight loss programs that are out there. I'm not joking or making light of it when I say that I've done SO MANY of them. I really have. I'm hesitant to speak to where I am now, but I feel that it's important to include the WW Simply Filling option. I think it gets overlooked by WW's traditional tracking program. My hope and prayer for myself is that this is a lifestyle change...NOT just another diet. I also want to encourage anyone who is struggling and has been on diet after diet to go see your doctor and really be honest with them. I've always tried to play my problems down and act like I was doing more than I actually was. This time, I was just honest about my frustrations, and it led to an answer for me. My goal is to lose 5 lbs. this month, which isn't huge goal, but I think it's attainable. I've learned over the last decade that anything that happens fast, probably isn't going to last. Slow and steady wins the race. And you know what? I'm not aiming to be the size I was in that first picture of me from high school. That used to be my goal, but I don't want to be the size of a 15-year-old. I just want to be healthy. The other night, Jason brought a photo of us into our room from 3 weeks after our wedding. It was from a photo booth at a friend's wedding, and we'd posted in on our fridge. I thought it got stuck to the bottom of his shoe or something, and I asked why it was in our room. He told me he brought it in to show me what he looked like right after our wedding. He said, "If I can just get back to that weight, I'd be happy staying there." As I looked at myself in that picture, I noticed the dress I was wearing. I can't fit into it anymore. It got me thinking. 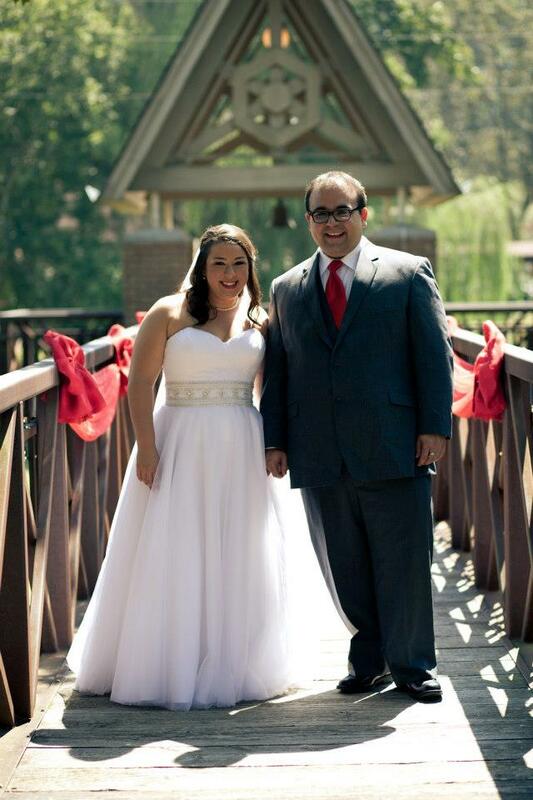 I may not have been in the best shape or the skinniest I have ever been on our wedding day, but I was happy with the way I looked and I was happy with my health at that point. My husband hasn't had the history that I have with diets and weight loss programs. He used to work out a lot to maintain his weight, and now he doesn't so he's trying to cut back on what he eats and exercise more. It's simple. He has a goal, a simple goal, and he's working to achieve it. He doesn't get caught up in all the rules and red tape like I so often do. Oh to be more like Jason, that is a goal of mine for sure. What diets or weight loss programs have you done? Was it a lifestyle change or just a fad diet? Do you get caught up in the rules and red tape like me, or is it a simpler process for you like it is for Jason? Do you have a hormonal, metabolic, or medical issue that has hurt you in your journey to lose weight? Posted on January 21, 2014 by Jessica Morales and tagged health diets Weight Watchers Simply Filling.